That’s the invitation I received from ‘Burn Hard’ through my couchsurfing account shortly after I’d posted that I was on my way to Graz, Austria. Considering some of the places I’ve slept in during the past months, a spot on a kitchen floor sounded fabulous to me. I promptly accepted Bernhard’s offer, and later that same day, after 75 kilometers of riding from Maribor, Slovenia, I arrived at my new host’s apartment. Bernhard’s bedroom, which also served as his workshop. He wasn’t kidding. There were several bicycles in his tiny kitchen, and a few more in his bedroom, which he also used as a workshop. 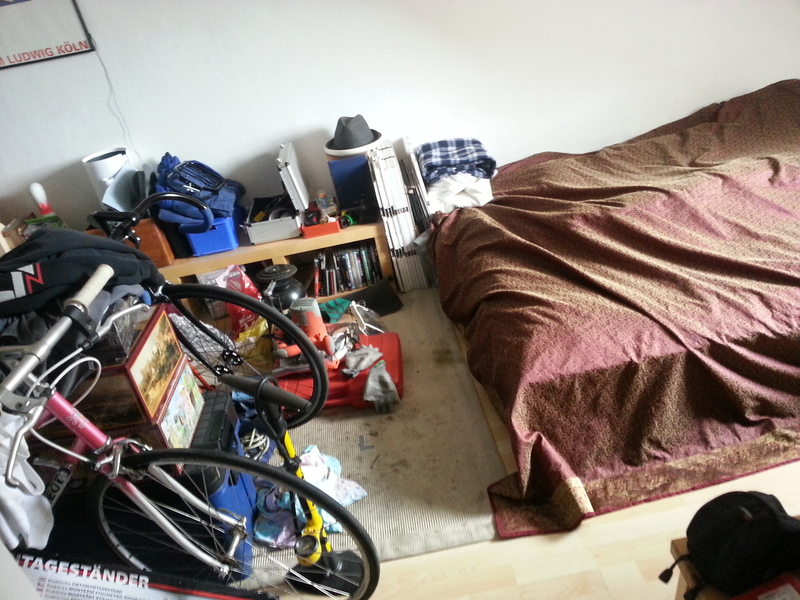 Every corner was occupied – with books, tools, bike parts, and of course all the regular stuff you’d find in a normal apartment. Yet somehow we managed to find a place for all my luggage, and sure enough once we’d move a few bikes around, there was even enough space on the kitchen floor for me to set up an inflatable mattress. I stayed over a week. “We do bicycle races in apartments,” he said. I immediately got a visual of a couple of guys getting drunk and fooling around on their bikes in one of their buddies’ apartment. But then Bernhard went on to explain exactly what he meant, and he started to paint a completely different picture. A few years ago, he’d been working on a Peugeot racing bicycle he’d just acquired. 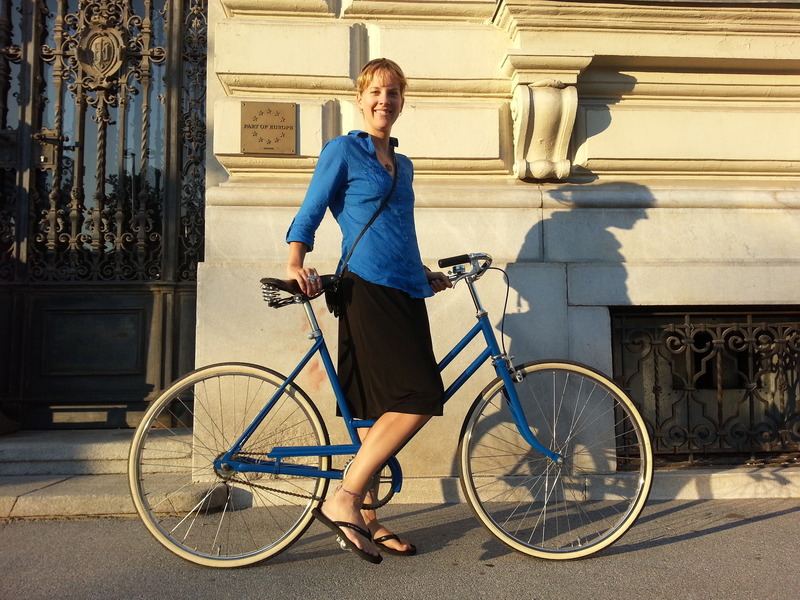 It was a retro bike, in pristine condition, but it needed new tires. These were special tires that needed to be glued to the rim. When the job was done, Bernhard needed to test the bike to see if the wheels had been done right. It was a rainy day, and Bernhard had no intention of being the first person to bring the beautifully cared for bicycle out into that kind of weather. So he cleared a path in the apartment he was living in at the time (much bigger than the one he currently resides in!) backed into the furthest corner of his bedroom, and launched off in the direction of the kitchen to try to get to the other bedroom. Naturally, dodging door frames, the fridge and other obstacles made the short ride a lot of fun, and soon his friend and roommate, Christoph, wanted to have a go. After a few tries, the boys finally managed to get around the tight corner in the kitchen to reach the second bedroom. 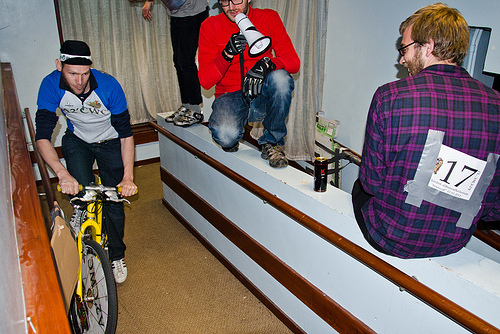 That night, what had started as product testing soon became the inspiration for a new competitive sport; thus apartment racing was born. 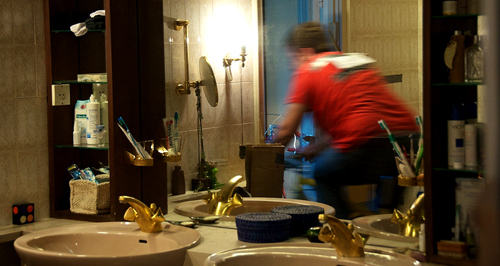 Sometimes even bathrooms have two doors… perfect for racing. Graz has a lot of old apartment buildings that are designated as ‘altbauwohnung’, which directly translates into ‘apartment in an old building’. The flats in these buildings are typically laid out in such a way that all rooms are interconnected, often with each room having two or more points of entry/exit. This circuitous configuration of rooms provides a perfect setting for something like a race track, and Bernhard and Christoph were determined to take full advantage of their lucky circumstances as tenants of one of these types of apartments.Within weeks, an official race had been planned. Invitations had been sent out to fellow cycling enthusiasts, rules were established, and a proper race track was prepared for the big event. Ten racers were registered for the first official ‘Grazer Old Building Cycle Criterion’ race. Once they’d all arrived, a quick glance around the room revealed the variety of styles of bicycles that the competitors had chosen to use for the race. There were some city bikes, a folding bike, a downhill mountain bike, classic 10-speeders, a highriser and even a 40-year-old ladies Puch bike. Clearly, the most important thing was that each rider be as comfortable as can be with their equipment. The rules were simple. Each competitor would have two 2-minute heats to complete as many laps as possible (one heat in each direction). If a foot touched the floor or a hand touched a wall to get out of a sticky spot, the racer would be penalized a lap. The winner would receive a case of beer, and have the honour of wearing the tubular tire that had started it all around his/her neck. The race was a huge success. The cyclists pushed the boundaries with their agile manoeuvres around tight corners, zipping by beds, sofas, a few dozen spectators and the other competitors’ bicycles at surprising speeds. There were a few crashes, and certainly a few bumps into door frames and walls, but due to the organizers’ foresight and a few strategically placed sheets of cardboard, only minimal damage was sustained by either the racers or the apartment itself. Before the event had even reached its conclusion, all enthusiastically agreed that another race should be planned. 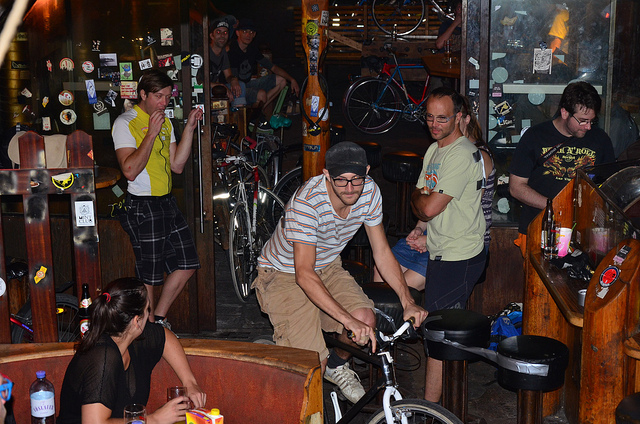 And so began the first season of indoor bicycle racing in Graz. When I arrived at Bernhard’s place and learned of this phenomenon, it took no effort at all for him to convince me to stay until the next weekend, when the 28th race was scheduled to be held. 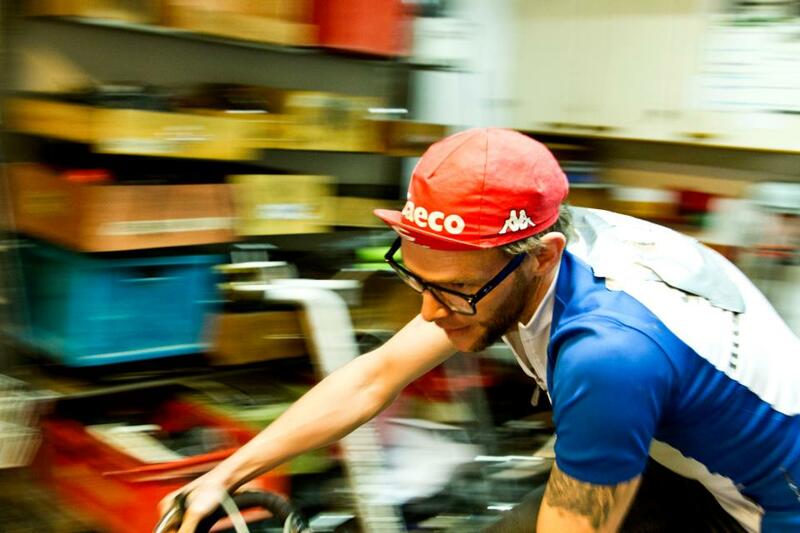 Now in its third season, indoor bicycle racing has seen its share of venues. Races have been held not only in old apartments, but also in an art gallery, an underground parking lot, a crêperie, a concert venue, bicycle shops, an abandoned animal clinic, a car workshop and the bike kitchen in Graz. (Want pictures? Check out their flickr account!) The movement is starting to cross borders, too. A race was held in an abandoned retirement home in London last year, and there are talks about a race being held in an old apartment in Rome this Fall. 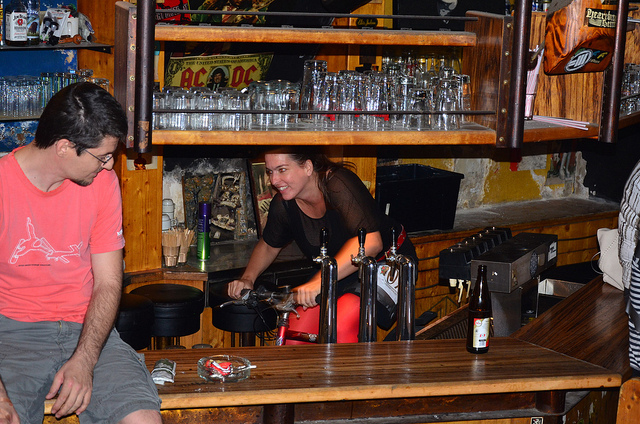 The race I would get to see was to be held in a local basement bar; there was no way I was going to miss this. The week spent in Bernhard’s cozy little apartment passed in a blink. He was an exceptionally considerate flatmate and a gracious host. He showed me around Graz (and let me ride some of his awesome bicycles around town; I felt so cool riding my first fixed gear bike…) and we took a day trip to his hometown of Gleisdorf to visit a friend of his who has an amazing collection of rare antique bicycles. A quick trip alone to Salzburg also helped to break things up a bit (poor Bernhard could breathe for a few days!) and before we knew it, race day was upon us! 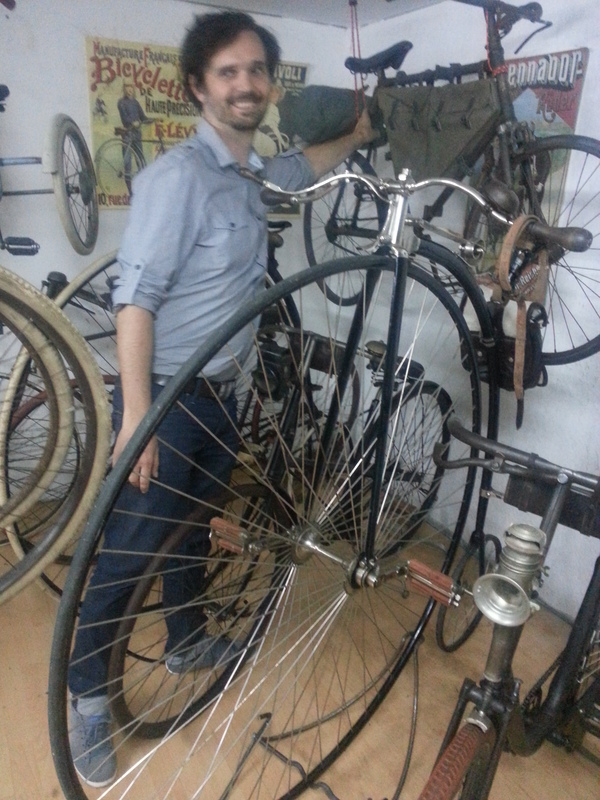 Max showing us his collection of antique bicycles; amazing! Need a ramp? Wood, cardboard and duct tape, baby. 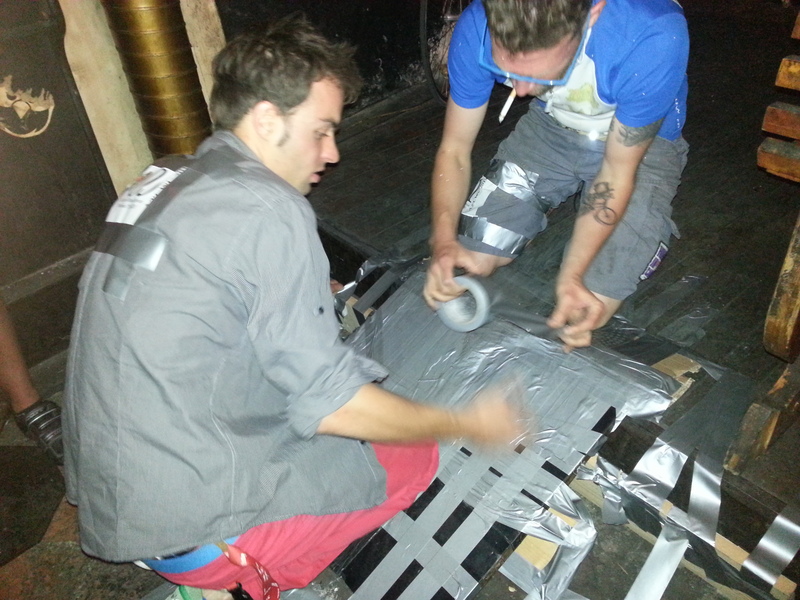 As soon as we arrived at the venue we started re-modelling the bar to transform it into a race track. Tables, chairs and bar stools were moved around, ramps were built to provide access to elevated areas. Sharp corners were covered and high-risk collision areas were protected. As the bar was being transformed, the 25 registered participants started to arrive. Some old, some young, some male, some female – all of them excited and full of anticipation. Once the free-for-all trial period and warm-up session was complete and the track was cleared, one could fully appreciate the wide array of bicycles that was in the room. 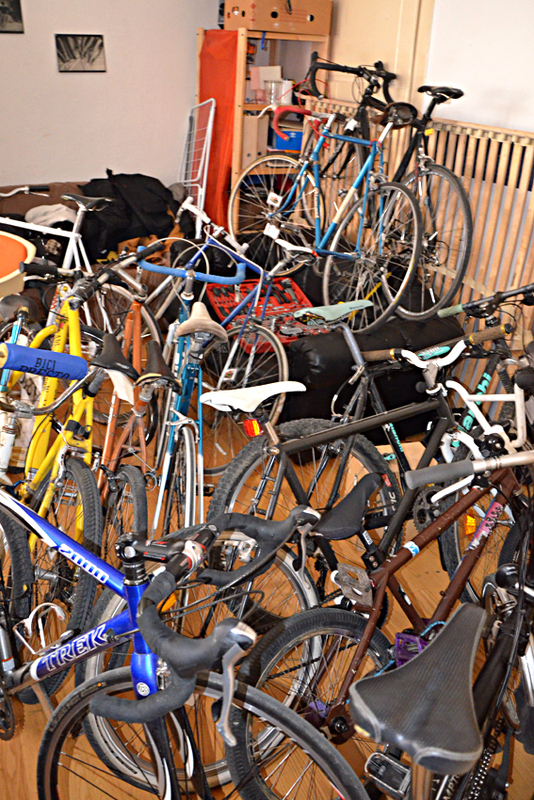 They were everywhere; lined up against the walls, propped up on benches and stacked on foosball tables, in all shapes, sizes and colours – a veritable feast for the eyes for anyone who loves bikes. The attire of the participants was varied too, ranging from jeans and a t-shirt to a full triathlon outfit complete with helmet, gloves and clipless shoes. As the official start of the race was approaching, some participants were relaxed and social, while others kept more to themselves, maintaining focus and composure as they visualized every move they would have to make to get around the track as fast as was physically possible. For the next few hours I was elated to be a part, at least as a spectator, of this awesome and growing sub-culture. I was impressed with the professionalism of it all, to be honest. Official racing bibs had been prepared for the participants and the time-keeping was done with the greatest concentration. Racers were casually interviewed with a megaphone in the moments before their races began, and a commentator was giving the play-by-play during the actual races, adding a sprinkle of humour to it all here and there. It took several hours for each of the participants to complete their two heats, and though the crowd was a bit thinner by the time the last lap of the day was completed, there were still plenty of people around to congratulate the winner. With an official time of only a fraction of a second faster than the runner-up, the victor was all too happy to claim his prize. 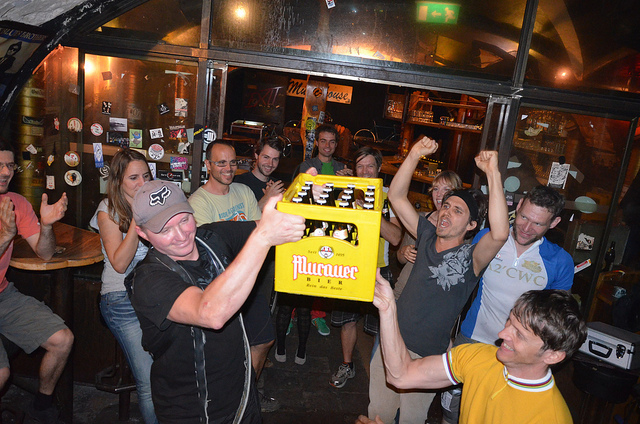 He beamed proudly as the tire was placed around his neck, and, as every other winner had done at the end of previous races, he walked through the cheering crowd with his case of beer, inviting everyone to share his winnings. One of Bernhard’s new tattoos. 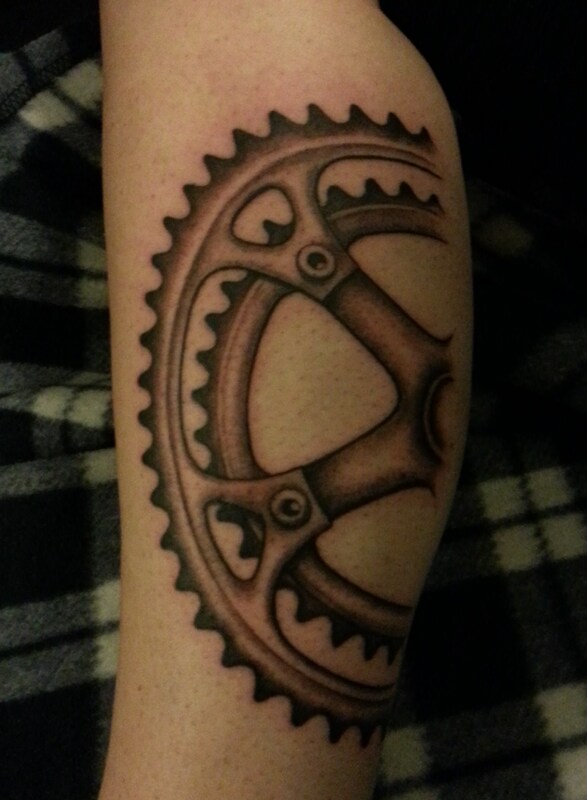 Daniela’s chain plate tattoo, which matches her bicycle exactly. Graz was a week of bicycle-related activities for me, to be sure, and I was delighted that the cycling theme spilled over into my tattoo work there as well. 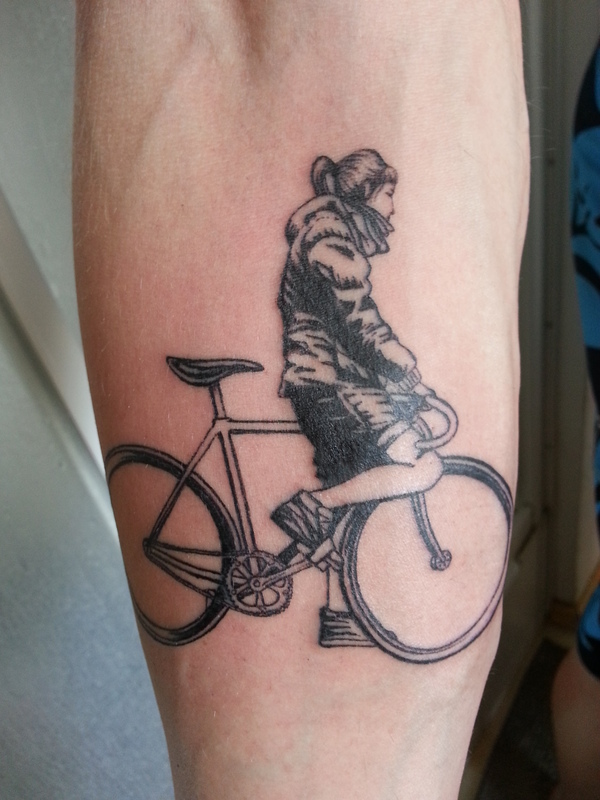 Out of five tattoos that were done in Bernhard’s apartment, three of them were specifically related to bicycles. All of my customers were cycling enthusiasts, and three of them had participated in the bike race I’d attended that weekend. I found the passion they all had for their preferred mode of transportation and the resulting lifestyle they all shared to be very inspiring… Definitely my cup of tea. 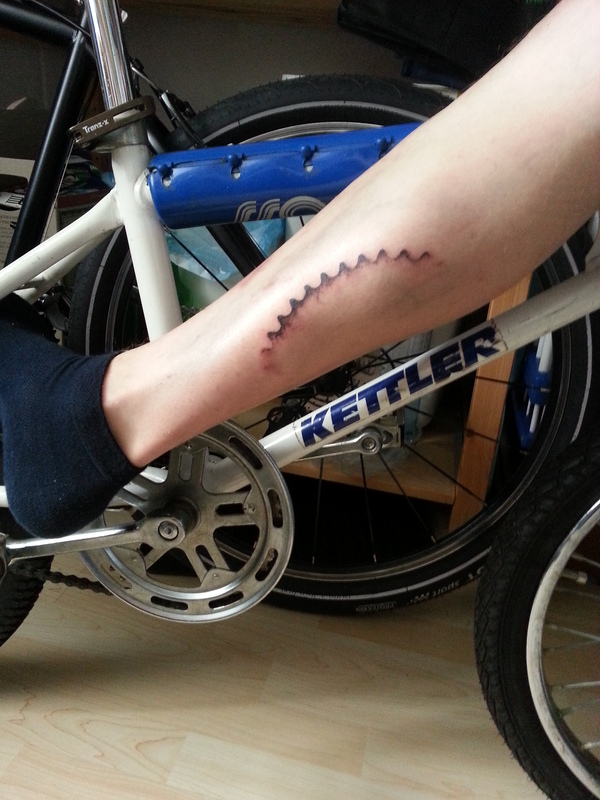 Yet another bicycle-related tattoo for Bernhard. Having now left Graz behind, I’m well aware that my experiences there have made a lasting impression on me. Though I’m no stranger to cycling long distances on a touring bike, I’d never before had the pleasure of moving around an urban centre on a fixed gear or city bike on a day-to-day basis. 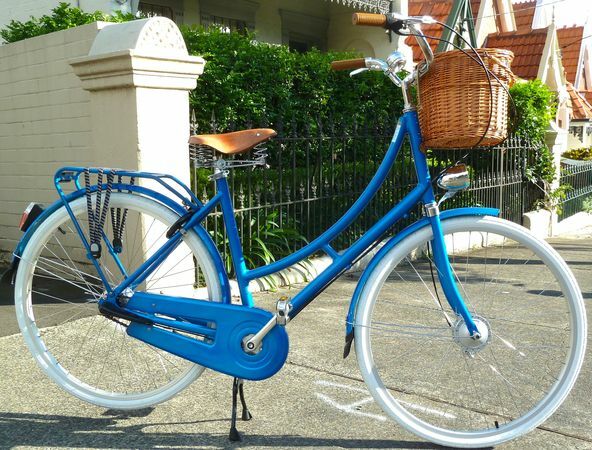 I was living in Taiwan when I really started getting into cycling; it was the last place one could get a positive and favorable impression of cycling as a fun, safe and practical way of getting around town every day. 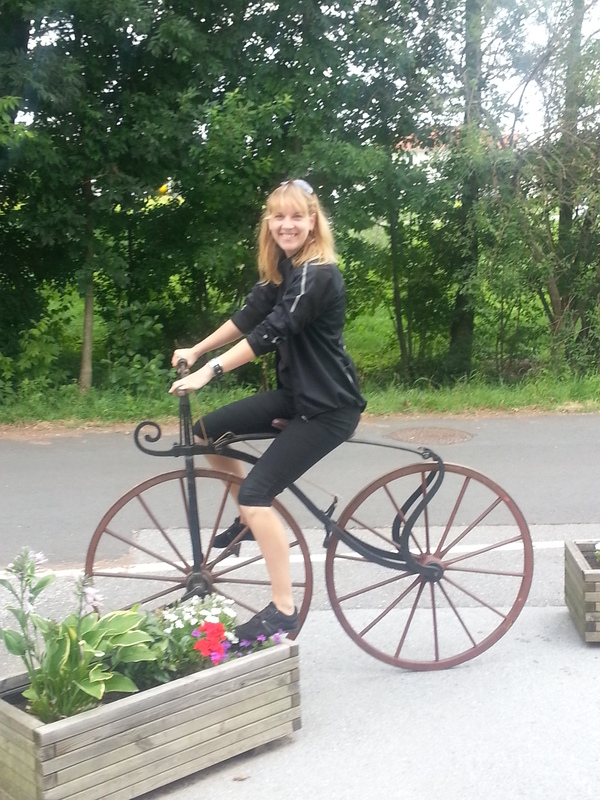 I think my little love affair with bicycles is only just beginning! It was a pleasure meeting you. I hope you had a good time. Although you didn’t leave an impression on my skin, you are quite to be remembered nonetheless. Godspeed for the rest of your journey! 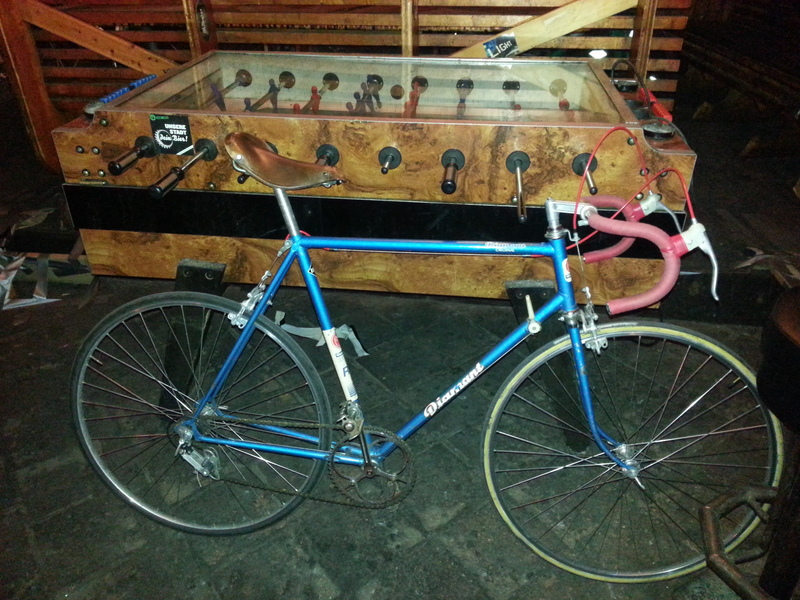 El Zutterino, owner of the Blue Fritz (the red/blue Diamant). Thanks for the comment! I had a wonderful time in Graz. Bernhard was an awesome host and he showed me the best parts of the cycling culture in the city for sure! Loved every minute… 🙂 All the best, and keep rocking that sweet ride! I came across your blog looking for a suitable tattoo to write about. I really like the one you did for Bernhard of the girl stopped on her bike. That apartment racing is such a wild idea, and the Austrian bent for thoroughness will surely make it go far. It must be such fun to travel around on a bike mixing work with pleasure. Look forward to reading more of your posts!